Princeton Readings in American Politics offers an exciting and challenging new way to learn about American politics. It brings together political science that has stood the test of time and recent cutting-edge analyses to acquaint undergraduate and graduate students with the substantive, conceptual, and methodological foundations they need to make sense of American politics today. 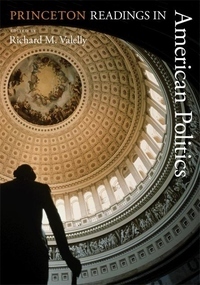 Princeton Readings in American Politics features writings by such eminent scholars as Larry M. Bartels, Robert Dahl, Martha Derthick, Howard Gillman, Jacob Hacker, Kay L. Schlozman, Deborah Stone, Marta Tienda, and Kent Weaver, among others. The book is organized in sections that cover the major American political institutions--the presidency, Congress, the courts--as well as core topics such as political parties, macroeconomic management, voting and elections, policymaking, public opinion, and federalism. Richard Valelly provides an insightful general introduction to political science as a vibrant form of inquiry, as well as a succinct, informative introduction to each reading. Rigorous yet accessible, Princeton Readings in American Politics can serve as a primary textbook or as a supplement to standard introductory texts.